The mean temperature from March to September affects the height-diameter relationship of many tree species in France. For most of these species, the temperature effect is nonlinear, which makes the identification of an optimal temperature possible. Increases in mean temperature could impact the volume supply of commercial species by the end of the twenty-first century. Height-diameter (HD) relationships are central in forestry since they are essential to estimate tree volume and biomass. Since the late 1960s, efforts have been made to generalize models of HD relationships through the inclusion of plot- and tree-level explanatory variables. In some recent studies, climate variables such as mean annual temperature and precipitation have been found to have a significant effect on HD allometry. However, in these studies, the effects were all considered to be linear or almost linear, which supposes that there is no optimal temperature and no optimal precipitation. In this study, we tested the hypothesis that an optimum effect of temperature and precipitation exists on tree heights. We fitted generalized models of HD relationships to 44 tree species distributed across France. To make sure that the climate variables would not hide some differences in terms of the local environment, the models included explanatory variables accounting for competition, tree social status and other plot-level factors such as slope inclination and the occurrence of harvesting in the last five years. It turned out that the temperature effect was significant for 33 out of 44 species and an optimum was found in 26 cases. The precipitation effect was linear and was found to be significant for only seven species. Although the two climate variables did not contribute as much as the competition and the social status indices to the model fit, they were still important contributors. Under the representative concentration pathway (RCP) 2.6 and the assumptions of constant form factors and forest conditions in terms of competition and social statuses, it is expected that approximately two thirds of the species with climate-sensitive HD relationships will generally be shorter. This would induce a decrease in volume ranging from 1 to 5% for most of these species. 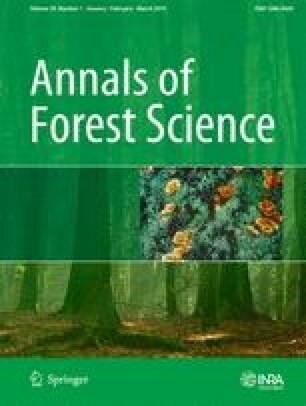 Forest practitioners should be aware that the volume supply of some commercial species could decrease by the end of the twenty-first century. However, these losses could be partly compensated for by changes in the form factors and the species distributions. The online version of this article ( https://doi.org/10.1007/s13595-018-0784-9) contains supplementary material, which is available to authorized users. The authors wish to thank the Institut national de l’information géographique et forestière (IGN) that provided the French NFI data. Thanks to the two anonymous reviewers and the Associate Editors for their constructive comments on a preliminary version of this paper.